Dramatica : I'm going to start tonight with the four stages of communication. Dramatica : In Dramatica theory, we see all communication as having four distinct stages. Now, its important to realize we are talking about "communication" here. There are all kinds of artistic endeavors that are not attempts to communicate. For example, you might just want to follow your muse, document the path, and let the audience make of it what they will. Many fine works are great not because the "communicate" but because they provide a fertile environment for conjecture. Dramatica deals only with the act of communication. Now to communicate, it means you must have an idea you want to get across. That idea may be a point of view on an issue, a logical conjecture, a feeling that you want to share, or an emotional result that will change your audience. Dramatica : will you be able to figure out how to communicate it. Moon, we are working our way into plot, by way of the four stages of communication. Stage one is to have an idea in the first place, that you want to communicate. Dramatica : This is true of ANY kind of communication. When we are talking about communicating through the medium of stories, Dramatica calls that first stage StoryFORMING. Storyforming is the process of working out just what it is you want to say. Once you have completely FORMED your idea, you move to the second stage of communication, StoryENCODING. Encoding is where you symbolize what you are trying to communicate, so it can be transmitted over a medium, and understood by your intended audience. Now, what is this symbolizing process? Suppose you have a feeling that you want to impart, Well, then you know how you feel, that's a Storyform. But what kinds of things do you have to show your audience, that will make them feel the same thing. You can't just come out and say what you feel, as there is no single word for it. Perhaps it is a feeling that you felt on a particular rainy day as a kid, and only then, never again. No single word or event in the world, will be able to handle that kind of description. So, you come up with some kind of setting or progression of events that makes it happen again for you. And then hope your audience will be similarly affected by what you have presented them. For the very first storytellers in ancient times, They might be hungry or looking for something in the distance, and have to find non-verbal symbols, like rubbing their stomachs while pointing at their open mouths, or holding their hands to shade their eyes and pointing, to symbolize what they meant. And they would assume that any other human being would be able to tune in to that, and understand the meaning. But they were just describing things, or physical states. And because we all share the same basic physiology, and live in the same physical world, we can assume that the nature of our physical selves, being much the same, would lead to an understanding at an intuitive level of the symbols we use. But the minute you want to get across logic, or feelings, those are both internal. How can it even be possible? In fact, the very fact that we CAN communicate such things, seems nothing short of miraculous. Unless...there is something just as similar about our minds, as there is about our bodies. And that is the case. We don't all think the same things, but we think the same way. So, when we want to communicate, a society first begins to build symbols, that describe the basic feelings, and logical givens that are common in that society. We fashion words and scenarios, that each of us learns through cultural indoctrination, that generate within us, a predictable logical or emotional response. MoonBailey : What about serendipity or having things emerge from the characters as you write? Dramatica : Serendipity in message or symbol? Dramatica : As we write a work, in any format, we are telling about the pieces that make up our message, and also about the way they hang together to create the "big Picture" message of what it all means when the smoke clears. Since we do not write the story all in one moment, we are only describing a piece of it at a time, and because a partial message always has many options, that only close down as we add constraints through additional influences that we describe in our work, then we have the opportunity to change our message anywhere within the remaining options, without violating, the integrity of the finished product. But if we become "inspired" and do something that is not consistent, then we will either have a work with holes, or we will rewrite what came first or not do what we were inspired to do. Dramatica : Yes, self-discovery is very important to many, but not all, writers. For example, James A Michner, works out all of the details of what he wants to write about before he writes a word, then he just describes the outline he has created. But other writers like to explore their topic, until they understand how THEY feel about it, and then go back and either write from scratch, or rework what they have so far to conform to the way they now see what their message is. The final kind of writer, just wants to document the journey, and doesn't care a hoot about internal logic. just wants to document the journey, and doesn't care a hoot about internal logic. And that is just fine too, and can be very moving and entertaining. It just won't come to a point. MoonBailey : Yes, you must create consistency and internal logic. Dramatica : Okay, so we have stage one as coming up with the message. Storyforming, whether it is done before you write or in rewrite, but ALWAYS before the work is given to the audience, if your purpose is to communicate. The second stage is Storyencoding. Where we symbolize what we want to communicate in culturally specific symbols that we have learned have a particular meaning in our society. Narrative theory has it that stories are transportable from one medium to another. But as we all know, that doesn't always work in practice. That is because each storyform, is the same in any culture or time, but the symbols used in the finished work, are culturally specific, and perhaps even medium or format specific. This is why books don't always translate to the screen and vice versa. Now, for stage three. Once we have these symbols, how do we unfold them for our audience. Suppose our goal is to Obtain the stolen diamonds... Do we have someone come out and tell us that in the first scene, or do we have a bunch of people involved in some unknown activity, and only make it clear what they are doing, as the story winds down to the end. Only in the last scene does our audience realize what everybody was after. And do we want to tell our audience the whole truth, or through them red herrings and put things out of context, so that they think things have one meaning, and then we spring a larger context on them that shows the friend was really the foe, etc. Well, how and when we unfold the true dramatics of our story, is the stage three process, of StoryWEAVING. Now, it is important to note, that the internal logic of the storyform or message, REQUIRES a particular order and meaning for events. For example, a slap in the face followed by a scream, is not the same as a scream followed by a slap in the face! The order makes a difference. When we are constructing our story each series of events, scene by scene and act by act, scans across the mind of the audience, like the scanning lines on a TV set. By the time they have all been played out, the audience can stand back in retrospect and see the big picture created by the lines they had followed one by one. Each line must make sense in and of itself. Colors and shading must come in the right order that does not violate the "givens" of the story, nor the givens of the audience. But they also must do a double duty. When all the parts have been laid out, they HAVE to describe the message you started out to tell. This happens in all linear-progressive art forms. You don't see the finished product all in one moment, but strung out over time, and then you reassemble it. So, you start with the message, stage one, encode it into symbols, stage two, and then transmit it through storyweaving, stage three. But the order of transmission can be scrambled, so that the audience needs to decode it in time as well as space, to put the internal logic of the story back together. So, the storyform actually calls for the order of dramatic events, but storyweaving allows the author the ability to play with their audience by choosing what order and how much for these events in the telling. And finally, we have stage four. Reception. We all see pictures in clouds. We make figures out of constellations, we look at ink blots in which there is no intended meaning, yet find some. This is because we seek order out of chaos. The mind IMPOSES patterns on that which it observes. So it is with the audience. An audience will seek to find meaning in the story being presented to it. BUT Each member of the audience is coming to the story with its own preconceptions, its own experiences. So, the symbols it sees, may not be interpreted the same as the author intended. This means, that when you want to communicate, the more broad your symbols, the wider the audience that will see them the same way, but the more specific your symbols, the more narrow your audience. As a result, to get complex concepts and feelings across to a mass audience, we must use broad symbols, each of which, does not do the job, but taken together, in the order in which they are presented, build up an understanding in the audience, much like winding string in a circle will build a baseball. We use our inexact symbols, to get all around the issue, like a dot to dot picture. By the end of the story, we hope our audience will connect the dots and then make the intuitive leap and say, "If this is where all these things are, then THIS must be what's at the center of it." And that thing at the center is what you wanted to communicate in the first place. Questions at this point? Pete P 432 : not yet. Dan Steele : the film writer must also worry about how the chosen encodings could be changed during that last stage is Stage four: Reception. Dramatica : Yes, Dan, for the film writer, their audience is not the good folks that sit in the chairs in the theater, but the cast and crew. You tell your story to the artists and technicians, you hope they get your intent, and then they go out as your messengers and hopefully interpret your work correctly. Dramatica : It is one of the BIGGEST differences in writing for film vs. books. Okay, so with these four stages of communication, we can see how the StoryWEAVING phase is what is commonly thought of as plot, but is really only half of what is going on. The essential internal logic of the story contained in the StoryFORM, is the first part, and the order in which it is presented is the second. 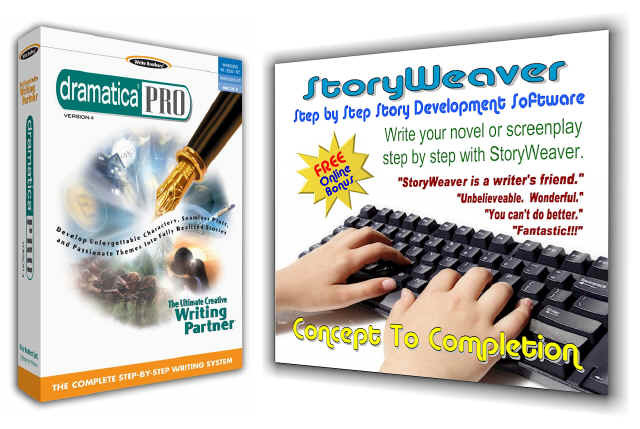 Now when it comes to the Storyweaving part, Dramatica can make some suggestions, but it is really up to the desires of the author, because it is an unlimited opportunity to play around with the order of things. Like flashbacks or flash forwards for example. Take a flashback that moves the essential dramatics along, one in which the characters are aware they are "flashing back" or remembering, and it is part of the storyform, because the characters ARE aware and therefore, it effects them after they have flashed back. But take something like "Remains of the Day." The characters know nothing about the flashbacks. They are only seen by the audience. So flashbacks IN the story are Storyform, Flashbacks OUTside the story are Storyweaving. It is the storyforming part that Dramatica can be very specific about Do either of you have the structure charts? Pete P 432 : no. Pete P 432 : ? Dramatica : Well, there is a four level structure in Dramatica. Keep in mind, Dramatica is not just a structure, You might consider including the chart when you separately issue the book, by the way half of it is dynamics that rearrange the structure. Actually, Dan, the chart is in the book already, and the book is already available. Anyway, the top level of the structure is most akin to Genre, the next level down is most akin to Plot. Pete P 432 : which book? The ones with the program? Pete P 432 : I do then have the chart, but I haven't looked at it. I will tonight. Dramatica : We have written the Dramatica Theory Book, which comes with the software, but is also available for $24.95, I believe, as a separate item. Now this plot level, consists of sixteen "Types". These are called "Types" because they are the Types of things that will be going on in the plot at any given point. And in fact, all sixteen will show up in every complete story. Its just that they will show up in different orders, depending on the overall impact (big picture message) you are trying to create at the end. These sixteen types are divided into four groups, called quads. One of the groups is in the Universe Domain, which just means they describe a situation. They are Past, Present, Future, and Progress. Pete P 432 : okay, now I remember what you mean. Dramatica : Good. There are four others in the Mind (or attitude) domain, Conscious, Subconscious, Memory, Preconscious. Dramatica : Well, a parallel world would depend on whether you wanted it to be A: A situation in which the characters find themselves B: an activity where one world is taking over from another, pushing the first one out (that would be Physics Domain for B) C: an alternative world where the problem is created by two opposing attitudes by the leaders.. Which would be Mind (a fixed attitude or prejudice) or D: an alternative world that has supplanted the old world, and the problems are caused because the way one responds to problems, (psychology domain) is no longer appropriate to the new world. As you can see, the concept of an alternative or parallel world is a storytelling one, as all "high concept" ideas are. For example, do you want to do a story about a State of war, which would be Universe, or the activity of waging war, which would be Mind. Either one is just fine, but Dramatica forces you to consider, just what kind of problem you are talking about that drives the struggle in YOUR story. At the Type level, we see groupings of these sixteen Types in four quads that help us see the kinds of concerns that will come up in each different domain, each different kind of story. And, in fact, all four domains will be in every complete story as well. One will be the Domain of the Objective Story. This is the area in which ALL the characters are involved. For the audience, it is the THEY perspective. Dan Steele : so there are what, maybe 4x4x4x4=256 different basic story types? All four Domains and therefore all sixteen types will be in each story, but with point of view gets involved in which TYPES of activities, describes the most broad stroke, overview of your story's plot. Dramatica : Here's an answer, Dan.. Right now, Dramatica only carries you through encoding. To weave, you take out the old 3x5 cards and begin figuring out which "appreciations" from the Dramatica reports, you want to illustrate in which scenes. Then you can change the scene order around for your storytelling. Dramatica : Yes, Dan, each subplot should have its own separate storyform. We are working right now on a future upgrade, that will allow all that kind of manipulation to be done within the program, with the goal of making Dramatica capable of carrying the author from forming through encoding all the way through weaving. Pete P 432 : Great, when will we see it? Dramatica : Well, I hope to see that version out this year. Its a lot of complex work, but we recognize the value. Pete P 432 : One quick question? Dramatica : Yes. Each storyform point needs to be illustrated in your story, or the audience won't know about it. There will be a hole. Think specifically at this point for example, Suppose your goal is "obtaining" Obtaining WHAT? You must pick the specific way in which Obtaining is the goal in YOUR story. Once you know that, you know a great deal about a lot of other things that must happen to support and grow from that.